Let’s say I have a food item in my pantry with a target of 2 and I use one so I’m down to 1 and I add it to my grocery list. While shopping I purchase 2 more. Wouldn’t it makes sense that when I update my pantry that I now have 3 of that item? Currently, the pantry item does not go above the target number. We frequently will purchase more than our target number if we plan on using the item in the next few days or if we will be having guests over and need to purchase more than the target. Excellent! I’m a new member of the beta group so I’ll test out the new version and leave comments there if needed. Thanks for the quick fix. I just recently wondered if it is possible to sync pantry lists between devices. I found your reply from May 26th. I followed those instructions and pushed the lists from my ‘main’ device, which is also the one with automatic backup. It said the push was successful and the amount of synced lists also increased. Then I wanted to pull the three pantry lists onto the second device, checked the boxes to select them, got a positive feedback that the pull was successful, but the number of synced lists didn’t increase. The lists were not to be found on this second device. So I tried it a second and third time, always with the same result. I noticed that the pantry lists also don’t appear when I’m logging into the web interface of my.mightygrocery.com. Hi Toftegard, thanks for contacting us. Due to unfortunate bug it is not possible to pull new Pantry lists from cloud in v3.0. As a workaround, you could create a Pantry list on your destination device with exactly the same name as on the source phone and try to pull again. Also, this is fixed in the new version. It is now in Beta test and should be available soon for public download. If you’d like to try the update, feel free to join the Beta Testing Group. I have only briefly looked at the Pantry feature. Is there a way to estimate consumption rates by week or month? I have some items I don’t use every day and it’s difficult to compute a daily usage. Tonya, thanks for contacting us. Unfortunately, in current version 3.0 it is only possible to enter Qty/Day. 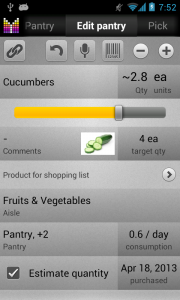 In the new version it will be possible to enter number of days to estimate consumption. The new version is now in Beta testing and should be available soon for public download. Can you scan items to add to the pantry list? Colette, yes, you can scan items to the pantry list. Please make sure that you have Barcode Scanner app installed. For more details please see Barcode Scan User’s Guide. 1) When i add multiple item to a Pantry from a Favorites list and i click to edit that item in the Pantry List and ‘Product for Shopping List’ it doesn’t link back to the original item in Favorites LIst from which it was selected but seems to linked to some unrelated product in some other list. 2)When i click on a depleted item in the Pantry List to add it to a grocery list and then i go back to this same Pantry list the depleted item is no longer checked. I think it suppose to stay checked to let us know that it’s already been added to a Grocery List and not necessary to add it again to the grocery list. 1) When you tap a Pantry item, the app searches for a Favorite item in the list-specific Favorite list of the currently selected list. If Favorite item is not found, the app looks up in Pick list. 2) Yes, it is supposed to remain checked. However, the check indicates presence in the currently selected shopping list (in the top selector). So if you change current shopping list, a check may go off. I think i might not have been clear in explaining item 1. Is there a private email i can send you some screen shot so that you can see the issue. Sorry for getting back to you a bit late..
RE: point #1 – OK i see what you are saying now after playing around with it a bit more. What’s the reasoning behind why the app. looks to the currently selected list to add the item to the specific grocery list? When the user ‘Checked out the item’ and added it to the Pantry, shouldn’t the app have known then from what specific list it came from so that when the user wants to restock it they just click on the depleted pantry item without having to select the specific list first? That kinda of behaviour is counter-intuitive. For the user to remember these little nuances of how the app behaves makes one more reluctant to use the app or the specific feature… because each time they use it they have to refamiliarize themselves witht he learning curve. 2)Same logic applies here as well. If a Pantry item is checked off, it should stay checked off, regardless of what the currently selected list is (If the appn remembers from what specific list the pantry item came from then there wouldn’t have to be list for the user to select and this whole thing becomes moot). It’s very counter-intuitive for a user to remember that looking at at a depleted pantry item that it s already checked off because he checked it off earliar when the selected a different list. The Pantry functionality is very useful. Hopefully it’s jsut becauase this is the 1st release of the Pantry functionality that these non-intuitive nuances are there. I hope in the subsequent releases that the functionality is updated to resemble more intuitive use case scenarios. But thanks for a great appn otherwise. MrB, thanks for your feedback. I see your point and we have plans for making “Multiple store assignment” feature going forward which should provide behaviour you expect. In the meantime the idea behind changing destination list is that users may want to buy items from different stores therefore using the specific store saved on checkout may not be correct. Thanks again for your considerations. MrB, unfortunately there is no way to see all your Pantry lists at once, but we will consider this feature going forward. Perhaps it would be just a selection of depleting pantry items. Perhaps you can implement a Master Pantry List that consolidates all the individual Pantry Lists- sort of like the Master Grocery List were you can select individual sublists (ie. specific stores)? MrB, yes, we are considering Pantry Master lists going forward. We are going to rename “Master lists” to “Super-lists” in one of the upcoming releases, so the name is planned to be “Pantry Super-list”. When i add add an item to a Pantry from a specific Store A Favorites list and then that item gets depleted in the Pantry and i click on this depleted item in the Pantry to add to grocery list how do i get it to add the item automatically to Store A Grocery List (since i only purchase this item from Store A only). Right now it seems that in the Pantry Menu, i need to select the specific Store A first before clicking on the depleted pantry item in order to add the item to Store A. But this is not ideal since i don’t always remember what store i bought this item from. Is there another automoatic way to do this? Also as a suggestion for future release, perhaps there can be an option so that when an item in the pantry is added to the grocery list it automaticaly picks the store which has best price comparison. Ok i just read Melanie’s post on May 18, 2013 (she’s trying to do the same thing i am), and i see your response. MrB, thanks for your suggestions. We may consider these improvements going forward. I love the new Pantry addition. However I have one suggestion. If my target quantity for an item is 5 for example and there are onky three items left in the Pantry, when I check the item to add it to my shopping list, it adds the target amount instead of the difference between the target quantity and what’s left in the Pantry. Wilfred, thanks for your feedback. In version 3.0 if you update Pantry using checkout from shopping list, qty of pantry items will be updated to match target qty. Do you see a different behaviour in the app on your handset? In the following update we plan to add purchased qty to the qty of pantry item. so far I think product is great but in regards to the pantry, I see that when I add items from my shopping cart it matches to the target amount instead of being on my purchase amount which is less than the target. You mentioned a new release will have this option when can we expect this? Thank you, Tammy. Tammy, thanks for your comment. The new update is coming soon, hopefully in a couple of weeks or so. Thanks for your patience. I have just upgraded my devices to the newest version and noticed the pantry function. My wife and I have been using this app for a long time and find this a very useful tool for items we consistently use. However, I can’t seem to sync the Pantry across devices. Is the only solution at this point to only “checkout” on one device for the Pantry to work correctly, or am I missing an option somewhere? Chris, thanks for contacting us. 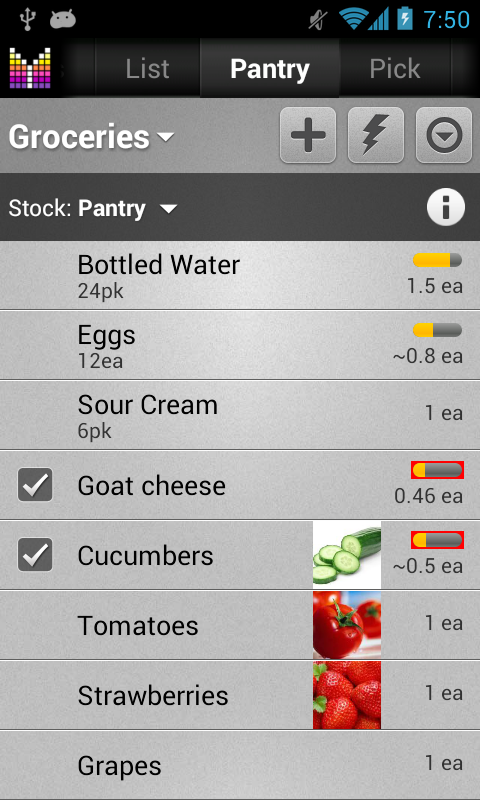 It is possible to sync Pantry lists between your handsets. Just go to Menu > Settings > Accounts > your account > Cloud actions > Push lists > select pantry lists you’d like to sync > Push lists. 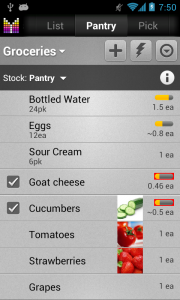 Then, on the other handset(s) follow similar steps to Pull your Pantry lists. Please let me know if you need any further assistance. Have been trying to get my head around the new pantry section. I have set up a whole list of new “Aisles” to reflect locations in my house eg Fridge, freezer, laundry etc. I then added items to the pantry & altered the aisle to reflect the location, (the item shows under all stores panytry lists though) – note all pantry items are from my various favourite lists. When I then choose an item from the pantry to add to a shopping list it links under each store not the favourite store it is specific to. For example I have “Pak n Save” my main grocery store, butter is on their favourites only, but when I add this to the pantry under “Pak n Save” it then shows up under each other store’s pantry. I thought this might just be how the pantry system works (one big list) but when I then select the item from the pantry list to add to my shopping list it shows under each store too not just the favourite “Pak n Save”. I have tried tried adding items to master pantry, to Pak n Save pantry, to another store pantry, no matter what way I tried it shows under each store, whether it is a favourite or not. Also if I select the item then from the Pak n Save pantry, master pantry or another store pantry, for adding to a shopping list, it doesn’t follow the favourite rules and also shows on all lists. I love the favourites feature as my shopping is very store specific, I get nappies from one store, my main groceries from another, fruit and vege from the green grocer etc, and love how favourites only list under the master and then by each store, I assumed the pantry would mirror this system. Am I using this wrong, is there a trick to ensure favourites are only linked to their specific store. Hope this makes sense, still loving the product though, just want to make sure I am using it right lol!! Melanie, thank you for taking your time and writing to us. Please be aware that Pantry list is not list-specific as your list-specific favorites. We may consider filtering Pantry items by list-specific favorites going forward. Keep your eye on What’s new page to see if this feature goes live.